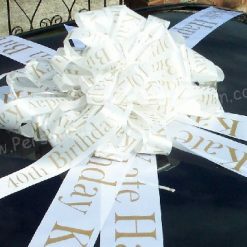 This large personalised pom pom big bow can be custom printed for new cars and weddings. 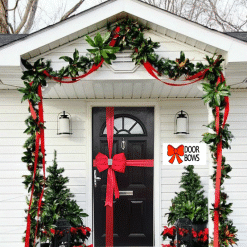 This extra large bow can be branded with your company details, or promotional messages. Our custom printed bows are made by printing the ribbon in our printing studio in Essex, and then the bows are constructed by our bow makers in-house. 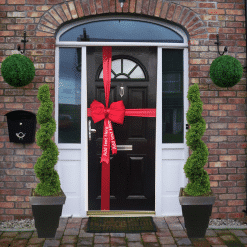 Each big personalised bow is made with love, using a showerproof ribbon, and will arrive in a box all ready for you to use, no further construction required. 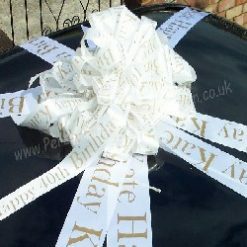 The large personalised bow has 2 ribbon ties on the reverse for tying the big bow onto your gift or car and will also have 2 decorative printed tails attached. As shown in our photograph you can also purchase extra personalised ribbons to co-ordinate with your bow by visiting our personalised ribbon section to make your purchase. Big bows printed with your text, Custom printed logos, text & images printed on tails and loops.